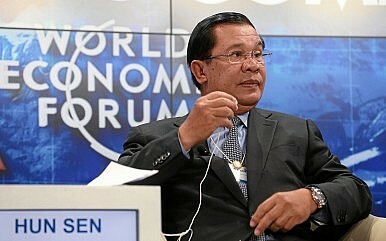 The country’s premier Hun Sen takes aim at activists battling a Chinese dam project. Cambodian prime minister Hun Sen gibed on Tuesday that he could deploy military hardware to stem any efforts at resisting government control in the country’s southwest, where activists are fighting against a Chinese-backed dam project, the Phnom Penh Post reported. “If you want to make an autonomous zone [in Areng], please come, and we will put BM21 in that area, but I don’t accuse them seriously like that,” Hun Sen reportedly said. The Post emphasized that Hun Sen’s tone was not entirely serious — and it even issued a correction later to make this point clear. Irrespective of the specifics and seriousness of the threat, Sun Mala, co-founder of the grassroots conservation NGO Mother Nature, said Hun Sen’s remarks were a direct threat to his organization. As The Diplomat reported previously, Mother Nature is one of several groups in Cambodia that has been fighting against the 108-megawatt, $400 million Chhay Areng hydropower dam in Koh Kong province, which is to be built by China’s Sinohydro Corporation. Mother Nature has recently been in the spotlight because its co-founder Alex Gonzalez-Davidson was forcibly deported following the government’s decision not to renew his visa. The government alleged that he had abused his NGO’s status last year when he set up road blocks that prevented local authorities from traveling in the district. Mala was also arrested along with Gonzalez-Davidson but was later released. Opponents of the dam project have warned that it would destroy one of Southeast Asia’s last great wilderness areas by clearing protected forest areas, displacing thousands of people, and threatening the breeding sites of dozens of endangered species. As The Diplomat noted in an earlier post, Hun Sen also declared in his Tuesday speech that construction of the dam would not start until at least 2018. He then begged people to “stop talking about it.” The Post reports that Hun Sen also admitted that the project would be a “disaster” environmentally, echoing concerns that opposition groups and activists had long been citing. But opposition Cambodia National Rescue Party chief whip Son Chhay, an opponent of the dam, questioned the sincerity of Hun Sen’s new-found love for nature. “Because the population of this country starts to become involved in helping Alex to protect this river, he has no choice but to say he loves the river,” he said. Move comes a day after the controversial deportation of a Spanish anti-dam activist.